Growing up can be challenging. Kids understand this better than anyone, but sometimes they need a little more convincing that they are not alone. As they learn about and navigate the world around them, kids respond and react to literature and other forms of media that directly relate to their lives and interests. As kids deal with adversity, whether they feel different or face difficulties for being a little different, having a friend and a story to relate to can help them develop the self-confidence they need to overcome their personal obstacles by becoming stronger and more self-assured. 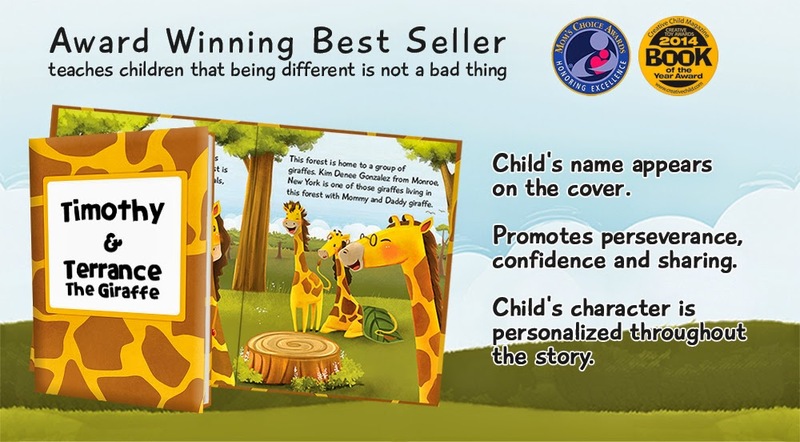 Terrance the Giraffe, a personalized book from KD Novelties, aims to help kids better understand differences from within themselves and with others, and has earned a Mom’s Choice Award in its endeavor. The Mom’s Choice Awards® (MCA) evaluates products and services created for children and families. The program is globally recognized for establishing the benchmark of excellence in family-friendly media, products and services. Parents, educators, librarians and retailers look for the Mom’s Choice Awards Honoring Excellence seal of approval when selecting quality materials for children and families. We are thrilled about this prestigious award and take great pride in knowing that our newest personalized title Terrance the Giraffe personalized children’s book has been named best in family-friendly products. About Terrance the Giraffe: In Terrance the Giraffe kids help Terrance overcome a difficult time in his life. Terrance is teased for being different, and your child is tasked as Terrance’s friend to help encourage Terrance and see the harm in bullying or teasing others. Whether kids have dealt with teasing from the receiving or acting end, they will learn a lot from this book. As they help Terrance through his experiences, they will better understand and empathize with his feelings, identifying with Terrance’s struggles and emotions. Terrance the Giraffe is available in hardcover and e-Book version for tech savvy kids. For ages 3 to 11 years. For more personalized products visit our website at www.KDNovelties.com.